Texas Real Estate License Courses Online FAQ's - Internet licensing school. TX Real Estate License Courses and classes online.Texas real estate commission (TREC) approved courses. What is the difference between your PDF format and other online providers? Can I have my course exams proctored online? Can you give me detailed step by step instructions? Are you approved by the Texas Real Estate Commission? How are the online quizzes given? What happens if I have technical difficulties or the system malfunctions during the quizzes? How do I get a username or password? What should I do if I forget it? Do I need to use a PC? What if I have a Macintosh? Why should I start a real estate career? Do I need a sponsoring broker before I start courses? If I have some college or a college degree do I have to take all 180 hours? Do I have to take continuing education? Why am I required to take MCE when I have been licensed less than 3 years? Will a "CORE" class be acceptable for my MCE renewal requirement? If I fail the final exam can I only retake the questions I missed? Are your courses approved by the Texas Real Estate Commission? In the PDF format do I have to be connected to the Internet the whole time? Yes. You may receive a full refund within 3 days from the receipt of payment. With the PDF (e-book) format do I have to be connected to the Internet all of the time? No! Thats the beauty of it. You can download the course material to your desktop, laptop or tablet and read and review the material offline at your leisure wherever you are. With the Online version you must be connected to the internet the whole time. That is why we highly recommend the PDF version. With the Online format, If you get disconnected from the Internet, then you will need to log back into your account. With the PDF format, you will only be online during the quizzes. The courses themselves are read offline. If you experience any problem while taking the course, then please call the 360training support number 877-881-2235 which provides customer service 7 days a week, 365 days a year. Yes. New TREC rules require each course quiz to be PROCTORED by a qualified third party. Yes. We have technical support available 7 days a week. The username and password is selected by the student. It should be unique and something that you can easily remember. We suggest using your e-mail address. You will use the same username and password each time you attempt to log in to the virtual university page to access your course. This information is entered in the returning students section on the homepage of the virtual university. Can I take the "Online" course with the AOL ® browser? These credits must be in the form the six TREC mandated core real estate courses. If you don’t have the proper amount of education requirements, most of the providers have courses you can take to satisfy those requirements. The 1st step is a Principles Course or pre-license course(s). This courses will teach you all about real estate including rules and regulations in your state, how to conduct a sale, etc. The 2nd step once you have completed the mandatory licensing courses is to study for the state required exam. This second step is the most important step as you need as much information as possible when you take your state exam. The last step is to register to take your final exam with the state. This is where all of your hard work and preparation pays off. Texas has a minimum passing score that must be reached in order for you to get your license. Once you have completed and passed the state exam you are given a salesperson status where you will be allowed to work under a broker as a real estate salesperson. According to the Bureau of Labor Statistics, real estate agents earned a median salary of $39,800 in 2013. The best-paid earned about $98,090, while the lowest-paid earned approximately $21,240 in 2014. Like most jobs the harder you work the more money you make. This is especially true in real estate. One of the best things about becoming a real estate agent is the freedom of being your own boss, having the luxury of setting your own hours, and the harder you work the more money you will make. With the real estate industry booming , you’re choosing a lifelong career and one where you can be successful as long as you work hard. I’m sure you have heard about friends and family members opening a real estate business together. 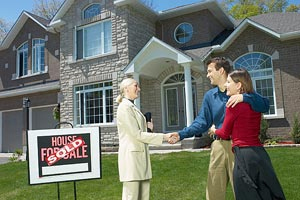 You will see many mother and daughter real estate teams or husband and wife teams. Another great thing about getting into the real estate business is that you don’t need a college degree to get started. The job outlook is strong and as long as people are buying and selling houses, leasing residences or commercial properties you’ll have a great career. Agents typically earn a commission for every house they sell or lease. Either they are helping a buyer find a home or they are helping a seller sell their home. Some of the wealthiest individuals in the world all hold a stake in real estate. An e-Book course allows you to download the materials in Adobe's PDF format. Once downloaded, the materials can be read at your own pace without the use of an Internet connection. No. However, you will need a sponsoring broker before you can work as a sales agent. You can apply now for an inactive license. 5) Finance I and 6.) Law of Contracts for the 180 "CORE" hours. In most cases, you have completed your SAE requirement ahead of schedule. You can call TREC for clarification. Will the 180 hours I took to get my salesperson's license count towards the hours required to get my Broker's license? Yes. Core classes will only be approved for MCE Elective credit. You will still need the Legal and Ethics courses. If you take a core class instead of a MCE class from a MCE provider you must send your completion certificate to TREC. If I fail the final exam on the State Test can I only retake the questions I missed? Q. Can you give me detailed step by step instructions? A. What is the difference between your PDF format and other online providers? Alli... "Convenient online course, Online text". CEsour.. "Our online course delivery system"
ReExp.. " Offered in an online format"
TrainA.... "All of our courses are 100% online"
Choose our PDF format for the quickest and easiest way to complete your real estate requirements. (E) educational officers of a military installation or correctional facility.